If you’re looking to explore Oklahoma’s weirder side, we’re here to help. Any Michael Bay fans out there? Well, head to Stillwater to see a full-sized Bumblebee transformer. Looking for something a bit more artistic? Wayne Coyne of the Flaming Lips has the perfect art museum for you in Oklahoma City. Enjoy some of the more unique things to see in the Panhandle State with these 15 unusual attractions. Route 66 might have gotten more popular thanks to television programs, but the cities along the highway have certainly kept it interesting. Hugh Davis built a blue whale dock as a present for his wife in 1972. People in the area came by and played on the whale in the completely landlocked state of Oklahoma. Now, it’s a treasured landmark that you should make sure to see when you’re in the neighborhood. This tower, inspired by the Mobius strip was recently restored to allow visitors to climb the spiral staircase and get a unique view of the town. At one time, there was a Mobius strip in the structure that children could climb on while pondering how the strip of material was twisted to become continuous with only one surface. Pops is a great place to eat when you’re taking Route 66 through Oklahoma, but the real attraction is a 66-foot tall neon soda pop bottle that sits outside this little soda ranch. Find some great souvenirs and unique sodas inside to take home. If you grew up in the era of “slug bugs” you’ll really appreciate this VW bug that has 15-foot legs to make it look like a spider. This attraction has been drawing crowds since 1979. G&M Body Shop has two locations in Stillwater, each with its own transformer. Optimus Prime sits at the east shop, and Bumblebee sits at the west shop, protecting Stillwater from any Decepticons. Both Transformers were originally built in Thailand, then shipped to Oklahoma. The Body Shop has updated the figures to make them even better. The domestic pigeon has been used by the military for communications for more than 2,000 years. Pigeons may be a ubiquitous bird to most, but when you come to the only museum in America dedicated to this creature, you’ll see them in a new light. An example of folk art just 3.5 miles off Route 66, this 60-foot monument is the tallest totem pole created in cement. A retired art teacher and folk artist was inspired by Native Americans to create totem poles in a park. This 18-wheeler sticks straight up in the air on its nose. It’s a fun and memorable way to advertise the Wilkins Oklahoma Truck Supply. See 51 vintage windmills, a wind generator and a reconstructed dugout with a sod roof to get an idea of how the early Oklahoma settlers might have lived. Ever wonder what happens to the famous horses and bulls of the rodeo when they die? Behind the National Cowboy & Western Heritage Museum, find a quiet garden that’s actually the burial ground for the good rides of our best cowboys. Gandini’s Circus toured Oklahoma in the early 20th century. When the circus disbanded, the trailers and equipment was left in an abandoned lot in a suburb of Oklahoma City. There isn’t much history about the actual circus, just some “haunted” circus cages and clown balls. Owned by Wayne Coyne, singer of The Flaming Lips, this art gallery is not your ordinary museum. Walk through the interactive room that requires you to don 3-D glasses to fully explore the art in the room. Leave a bit of yourself behind by drawing on the walls. Younger’s Bend is the final resting place of Belle Starr, but it’s also associated with many other legendary outlaws, including Frank and Jesse James, the Younger Gang and Felix Griffin. It’s on private property, but the current owner has restored the grave and allows visitors during daylight hours. This is the only prehistoric American Indian archaeological site in Oklahoma which is open to the public. More than 150 acres have been preserved to study the artifacts of the Spiro people, who are still a mystery to us, even though so much has been discovered. 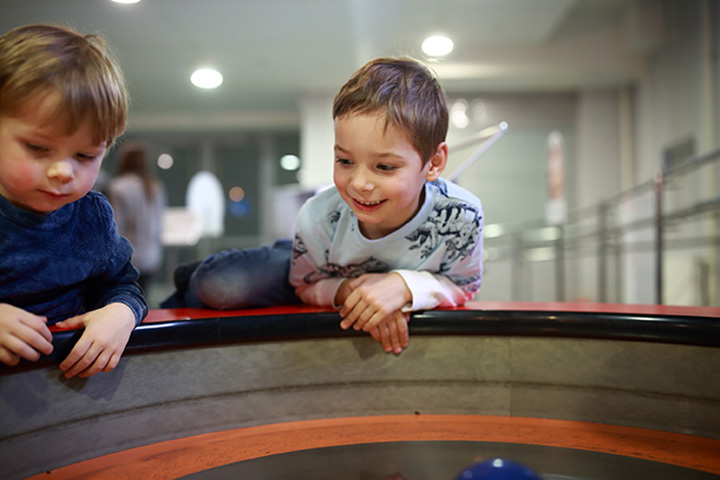 This museum is dedicated to those beloved friends you played with as you grew up. One entire room is devoted to Batman. The collection of toys and action figures numbers 13,000, many of which are still in the original packaging.